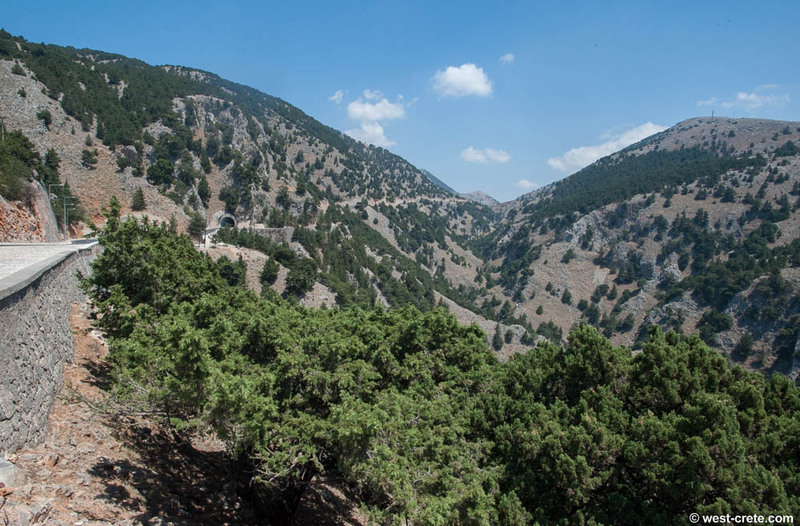 It is much easier to walk than Samaria: walking distance is 8 km, total descent is around 600m and the average walking time is about 2.5 hours. 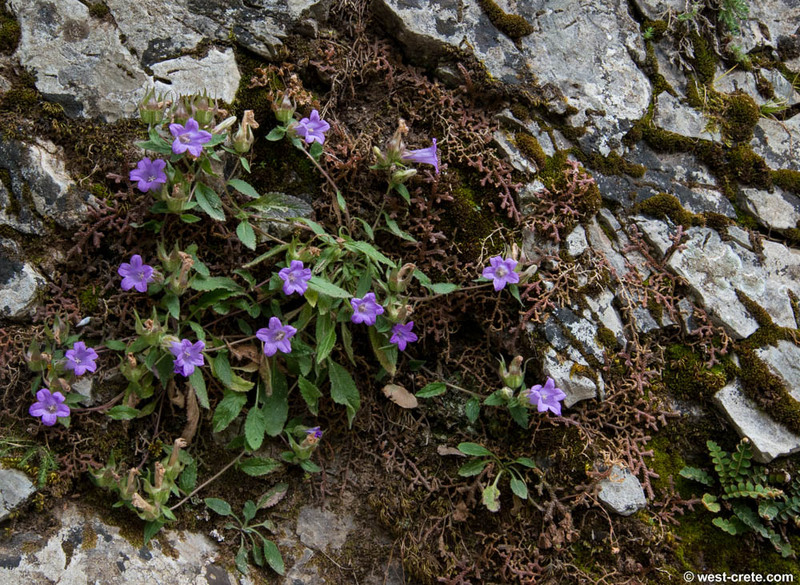 The path is generally easier underfoot. 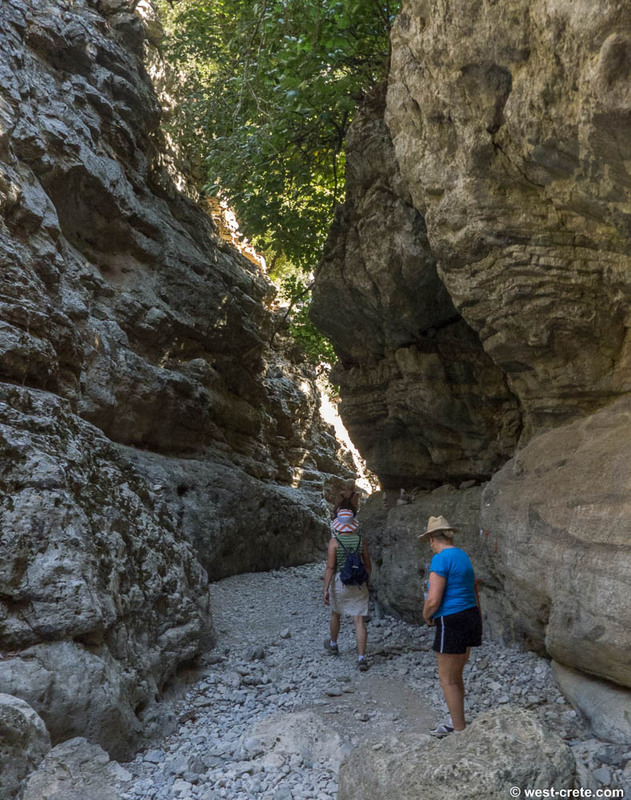 This is the sort of walk that you could easily walk with children. It also would not need to take a whole long day. 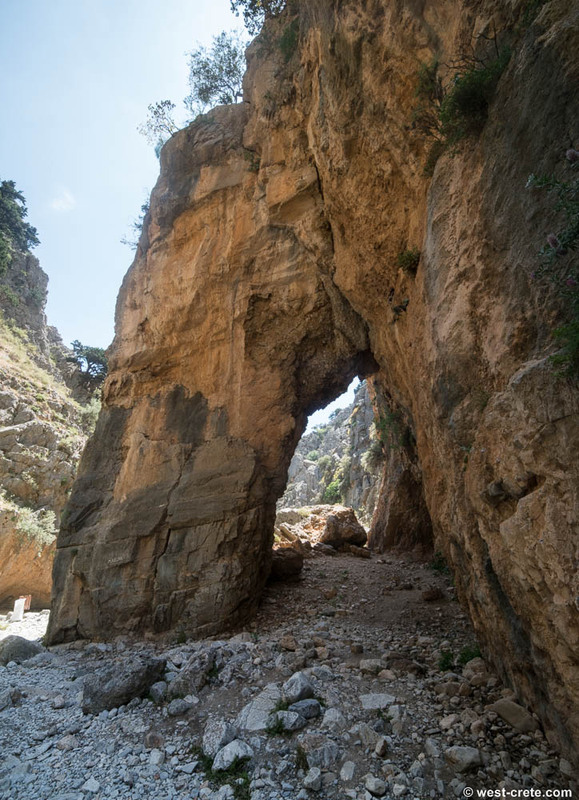 The gorge of Imbros is easier to access: there is a good road (to Hora Sfakion and South Crete running along the upper part of the gorge) and no ferryboat trip is needed to get you back. 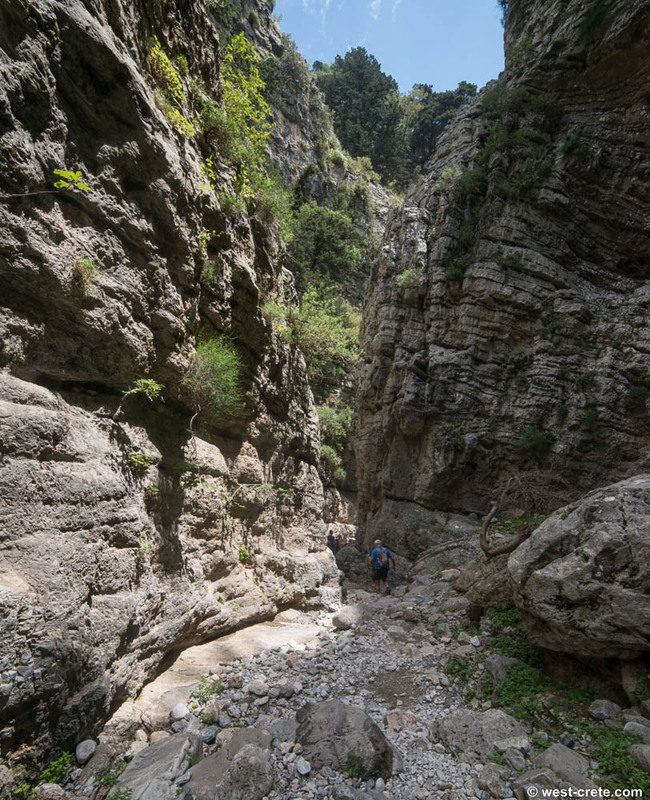 Despite being much smaller in size than Samaria there are some very spectacular sections, especially the several very narrow passages. 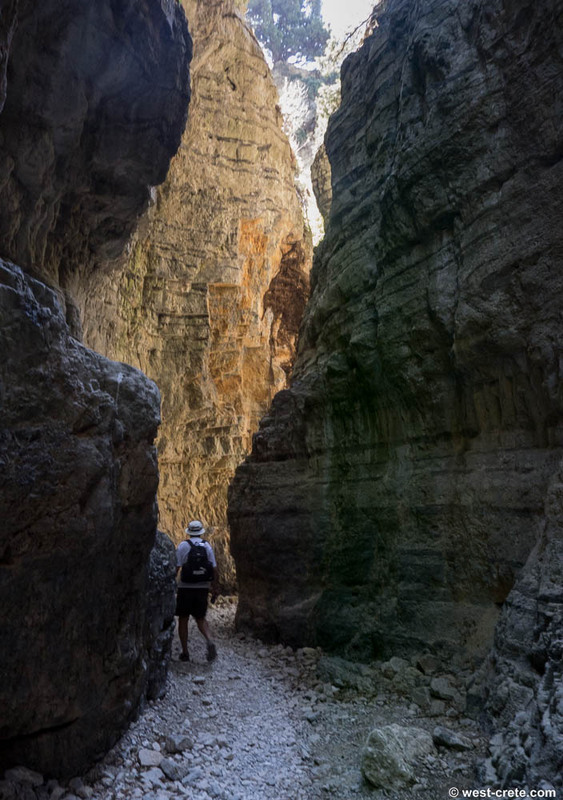 The gorge is open all year around. 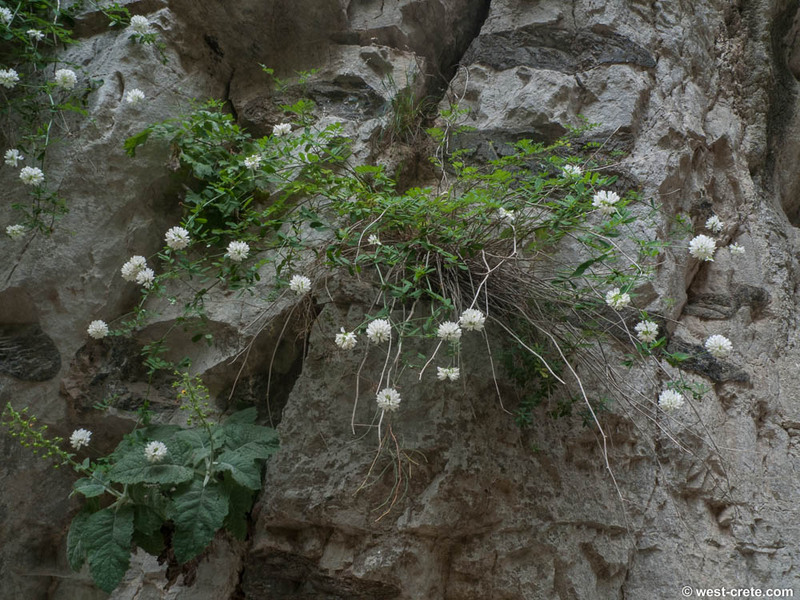 This makes it especially popular in spring time (April) when the gorge of Samaria is generally still closed. 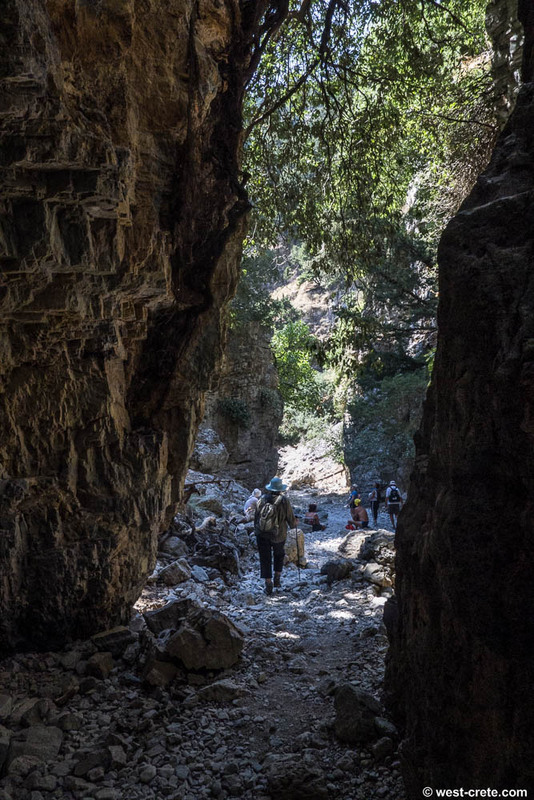 For a number of people (especially Australians and New Zealanders and to a lesser extent Brits) walking through the gorge of Imbros is almost a pilgrimage. 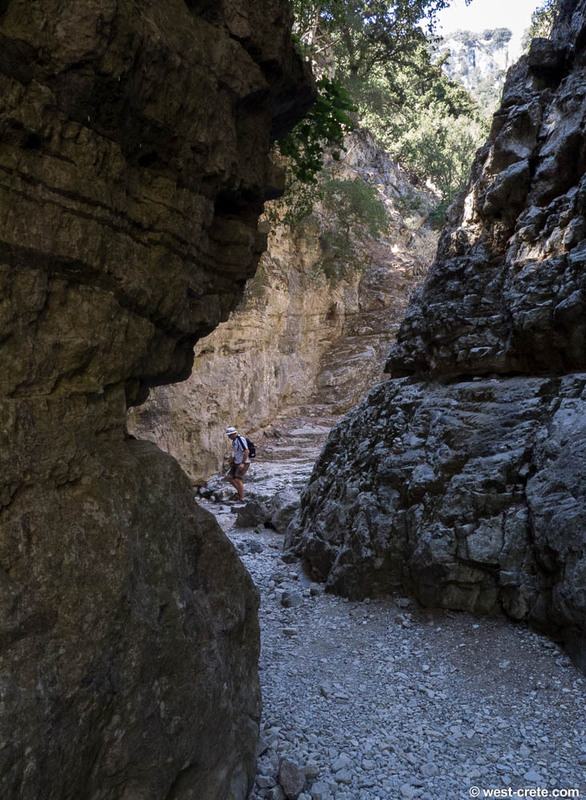 Many people have had parents or grand-parents who fought with the Allied troops in Crete and walked through the gorge in May 1941 in order to escape the island to Egypt. 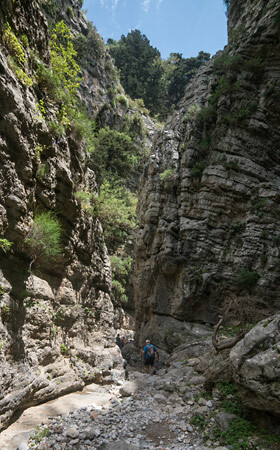 The path into the gorge starts just below the village of Imbros. 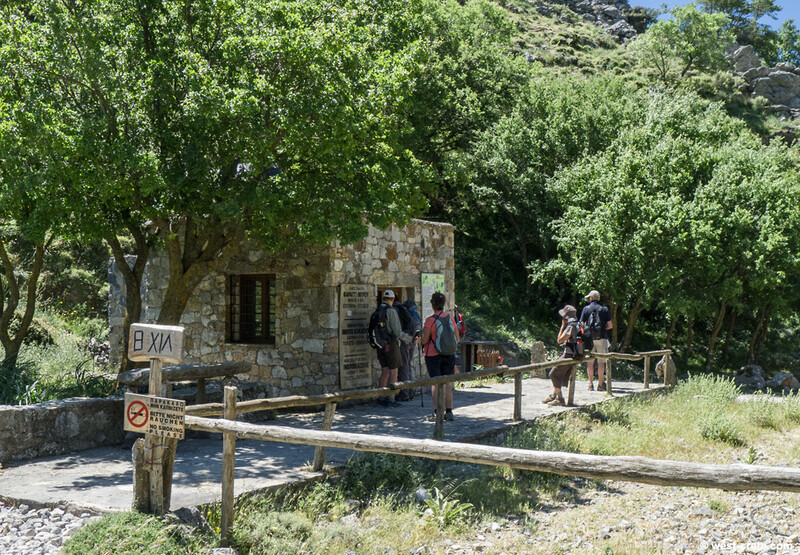 There are several cafés and tavernas (with ample space for parking) in Imbros and the routes to the entrance of the gorge are clearly marked. 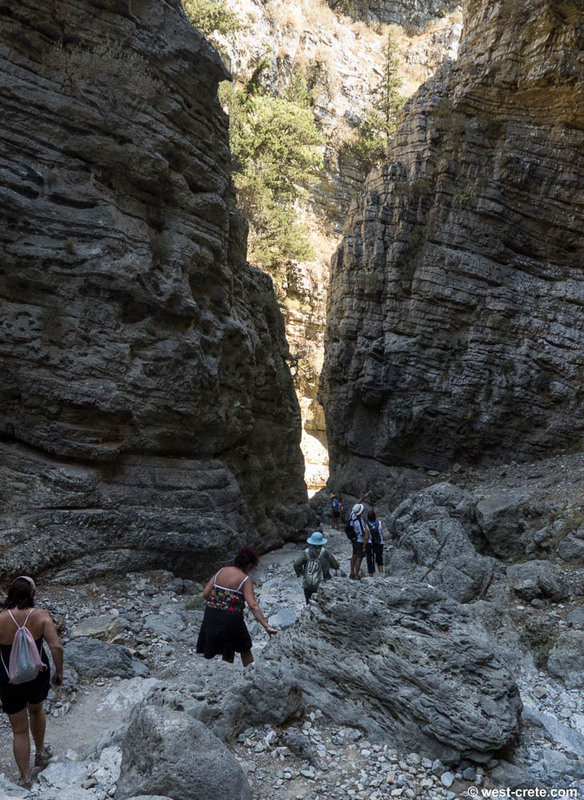 Depending on where you start from in the village it will take you between 3 and 10 minutes to get to a small house where you will need to purchase an entrance ticket (2 Euro in 2016). 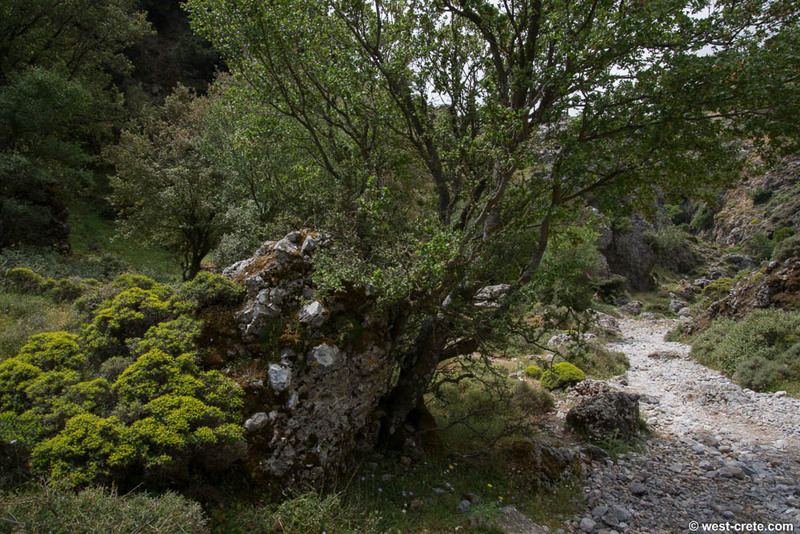 From there the path descends gently into the gorge heading south. 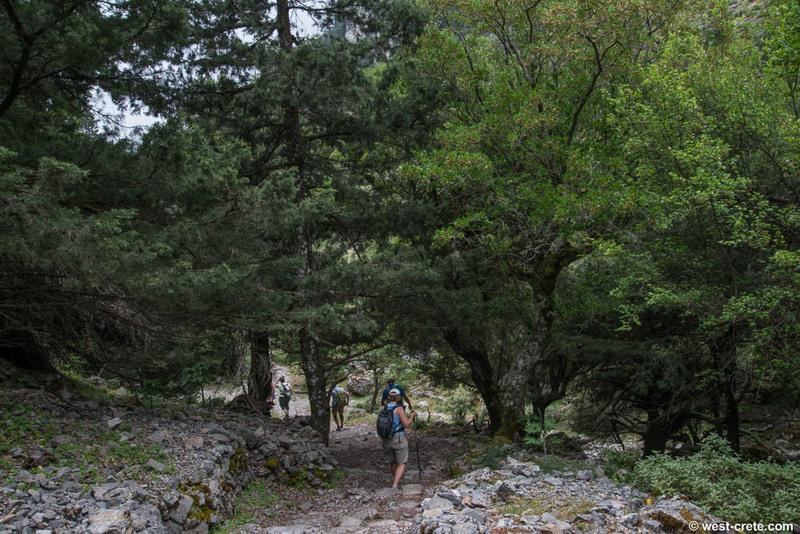 It is never steep and not particularly difficult (running shoes are good enough for this walk) but as everywhere in Crete the path is stony so you need to pay attention to where you put your feet. 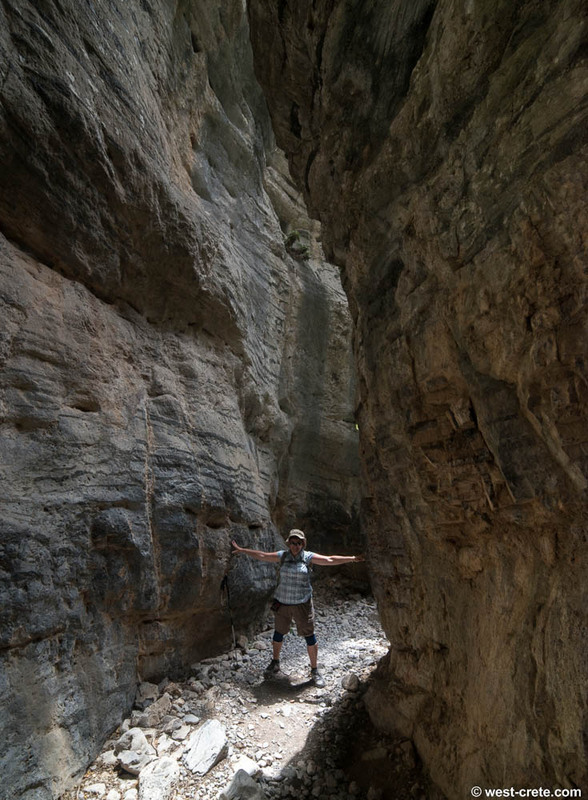 Because the gorge is fairly narrow (under 2 meters wide at one point!) and has plenty of trees you will have shade most of the time. 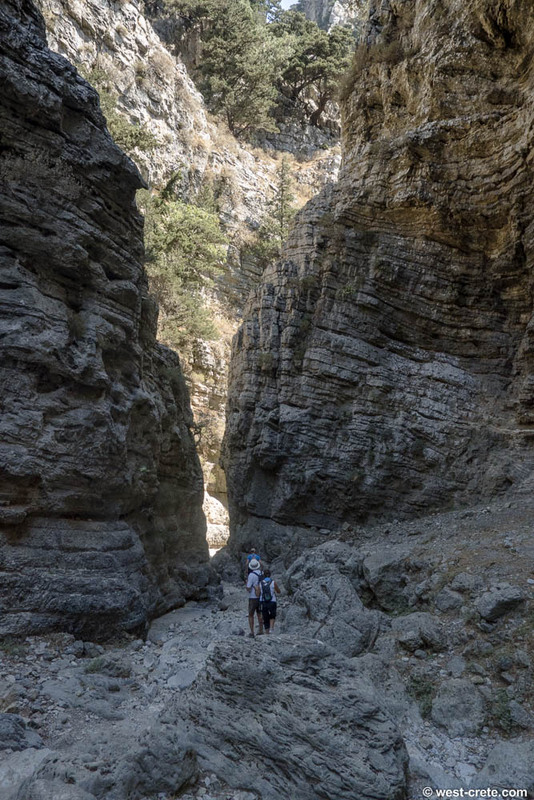 The gorge is much smaller in height as well as length and less majestic than Samaria but this also means that at all times you are right next to the slopes and cliffs and have a much better opportunity to see plants and flowers at close range. 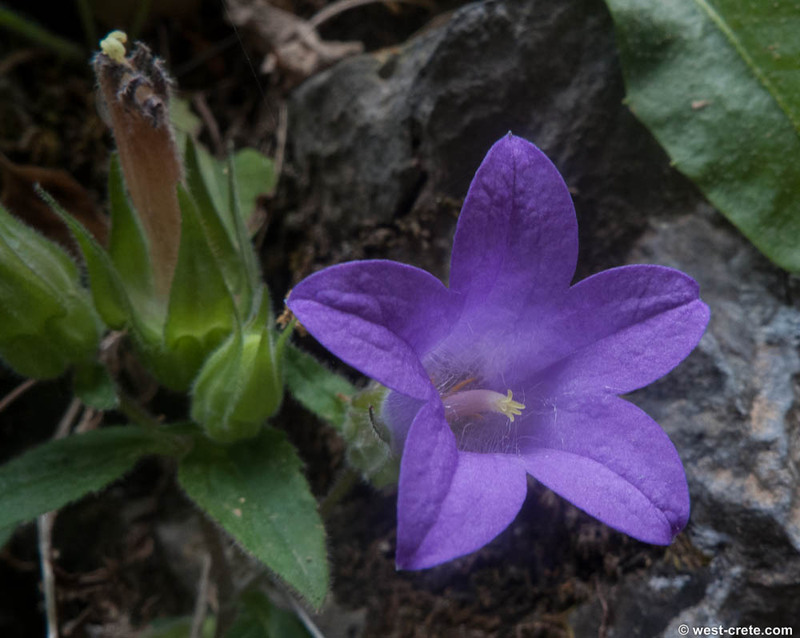 And there are plenty of interesting flowers to see, especially in the spring. 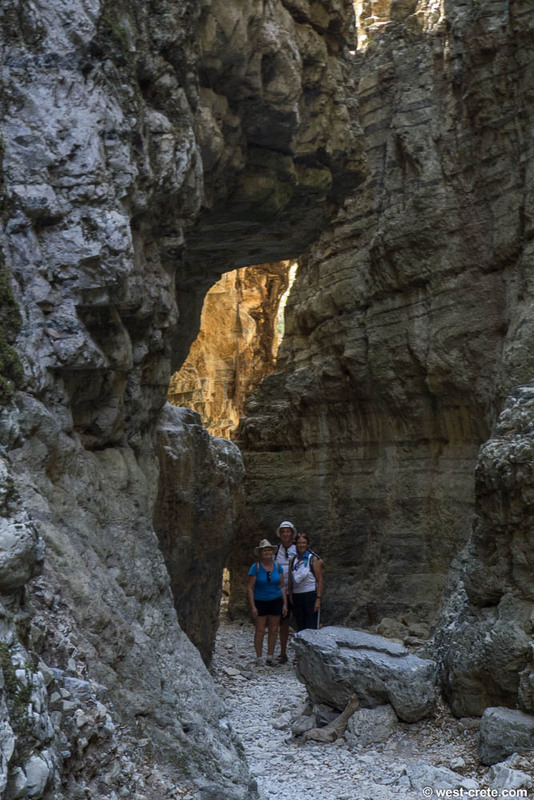 After around 90 minutes walk from the gorge entrance booth (2 hours if you walk really slowly) you will pass an impressive stone arch on your right. 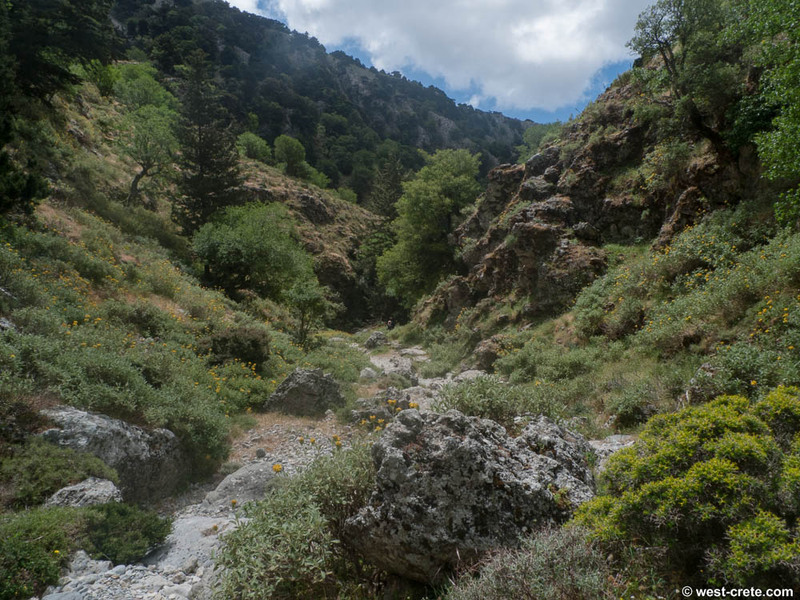 This is almost the end of the route and if you are intending to walk back up to Imbros it is a good point to turn back. 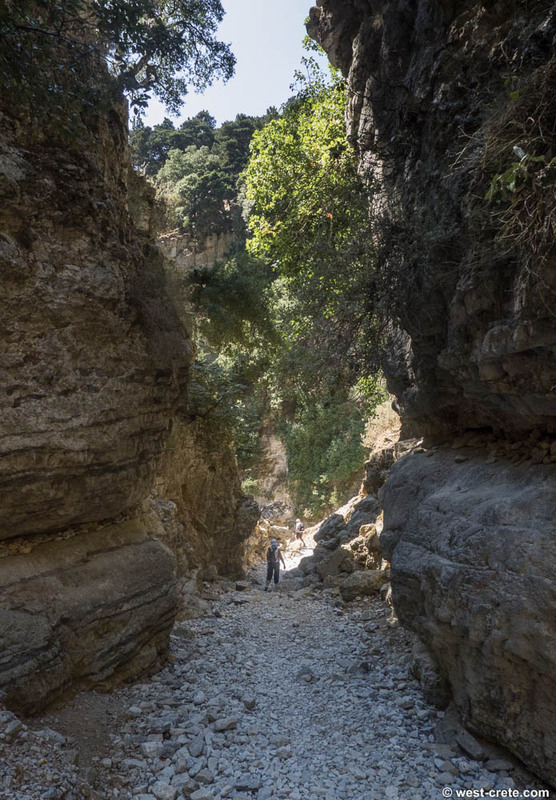 After this the gorge widens a little and after around 15 more minutes you get to the road and the village of Komitades where you'll find quite a few tavernas. If you are on an organized bus tour this is where your bus will pick you up. If you need to go back to Imbros (or Hora Sfakion) ask in any of the tavernas. Plenty of the locals run unofficial taxi services (often in the back of a pickup which is quite an adventure) to cater for these needs. 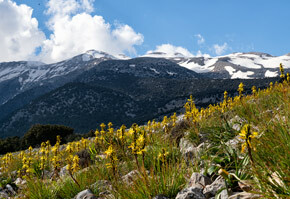 The village of Imbros is located along one of the main roads that connects the North of the island to the South. It is connected by public bus to Chania (via the Chania - Hora Sfakion route) but buses are not frequent so they are not a flexible solution to get there. 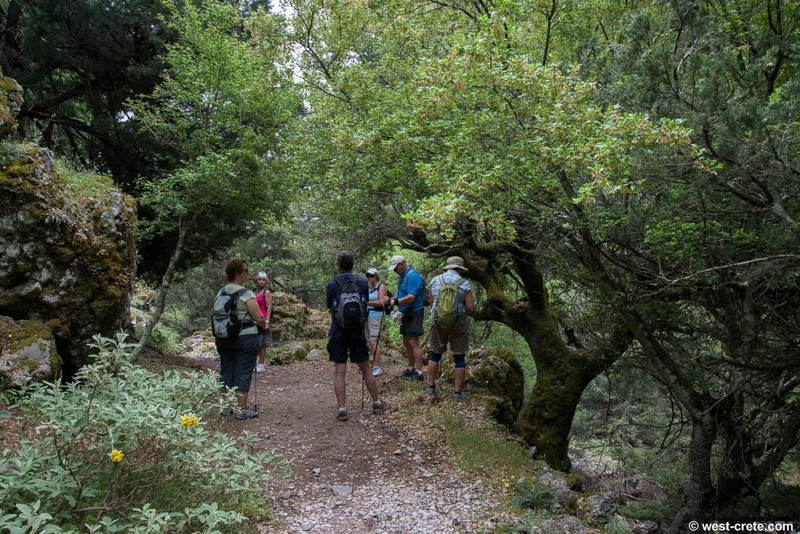 The easiest way to do this walk is to book a tour with a local tour operator (ask at your hotel what is available in your area). All your transport arrangements will be taken care of but you'll have less flexibility. 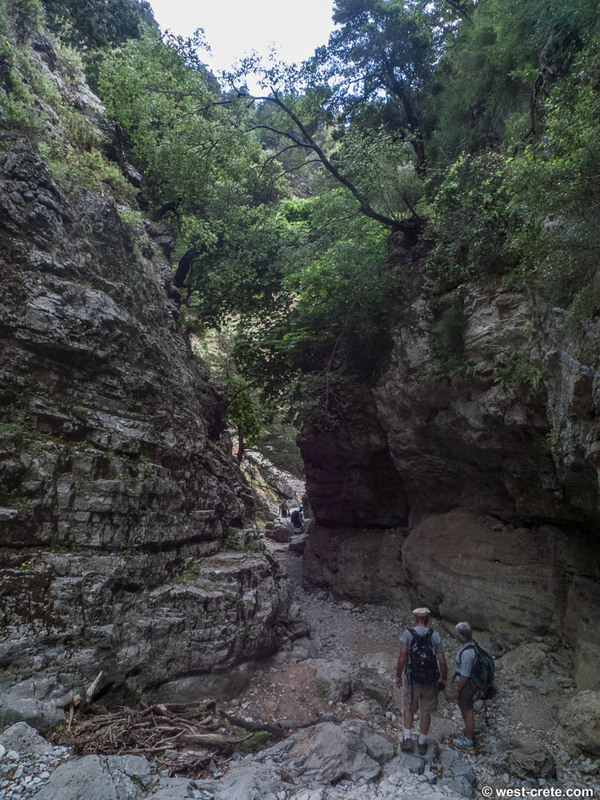 a) walk back up to Imbros. 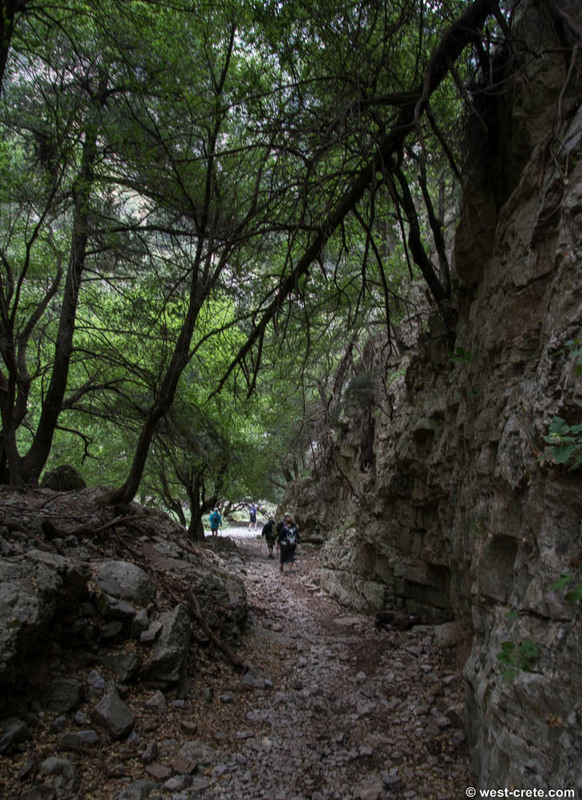 It's not such a long walk, especially if you don't go all the way down to the road and turn back a little earlier. 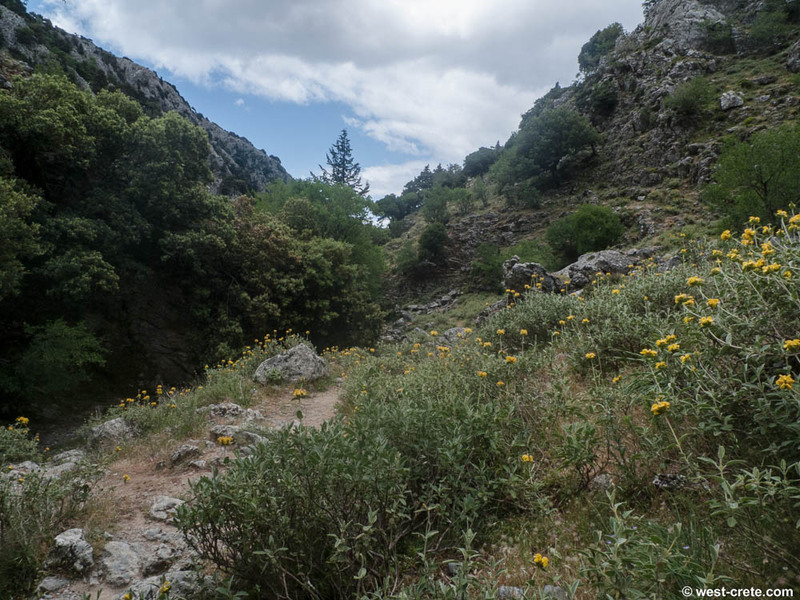 b) walk all the way to Komitades and catch a local taxi (generally not a taxi but a private car) back to Imbros. The going rate per person was about 5-6 Euro in 2013 for a shared ride. 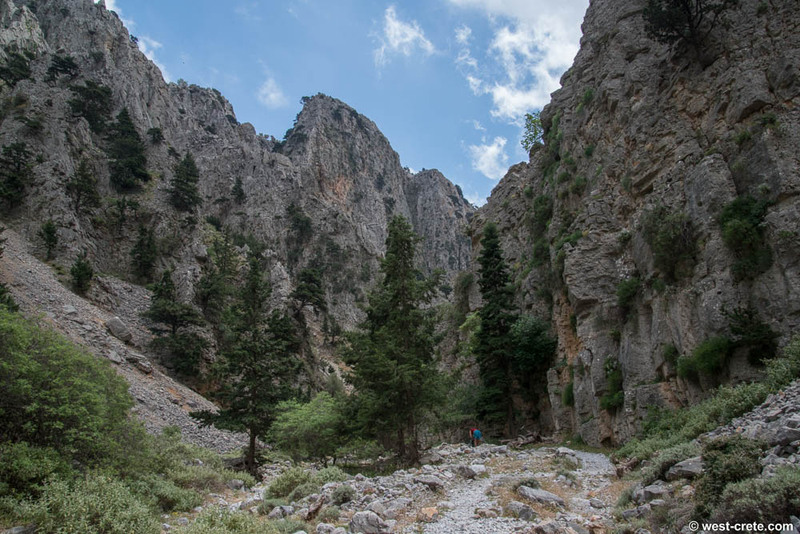 c) another alternative (if you have your own vehicle) would be to drive down to Komitades in the morning, walk up towards Imbros and pick up the public bus that comes from Chania (going to Hora Sfakion) at around 15.15 (double check the times!). The bus can take you down to the junction that goes to Komitades and from there it will only be a 10 minutes walk back to your car. Alternatively if you are staying in Hora Sfakion you could catch a public bus to Chania in the morning, get off on the way at Imbros village then walk back down either all the way to Hora Sfakion (it takes about an hour from Komitades but is along the road, with no shade) or try to get a taxi ride to Hora Sfakion. 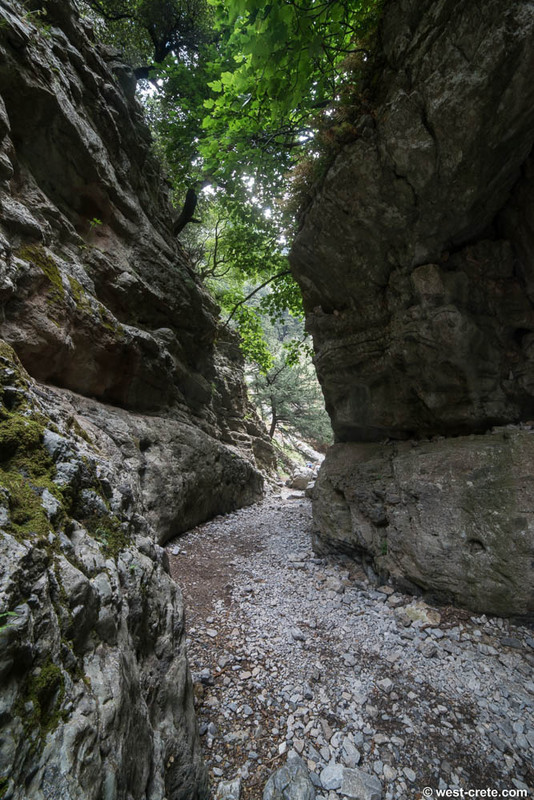 You can walk through the gorge all year around but as in all gorges do not walk on rainy days because of the risk of rocks falling from cliffs. 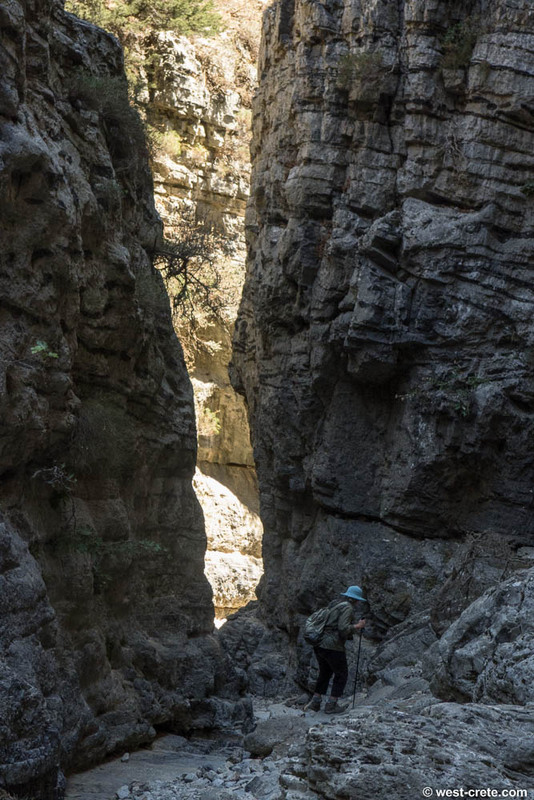 There aren't too many vertical cliffs in Imbros so this advice is less critical than in other gorges such as Samaria or Aradena. 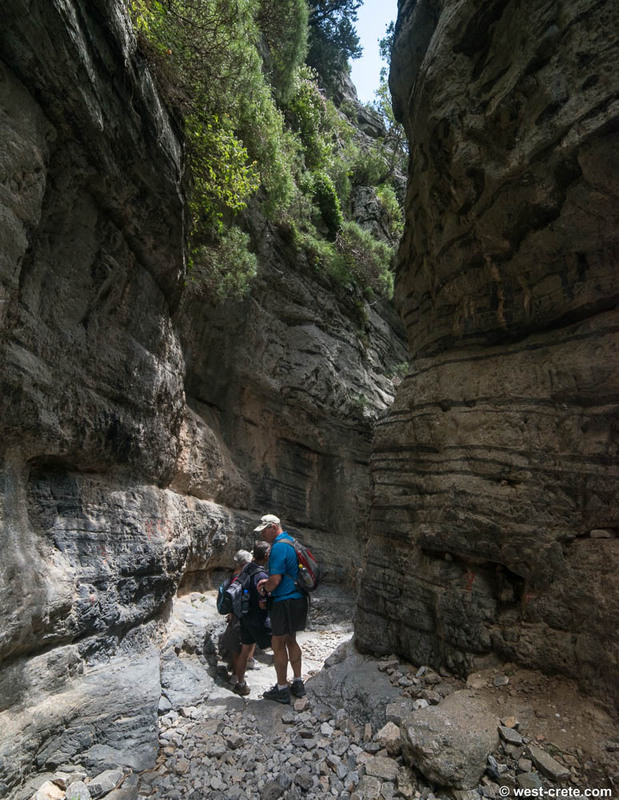 The gorge of Imbros has no stream running through it so water in the gorge would only be an issue during or shortly after very heavy rainfall. I have seen the gorge blocked by snow in the upper part (which is at around 700m) but that would only happen (rarely) in mid winter. 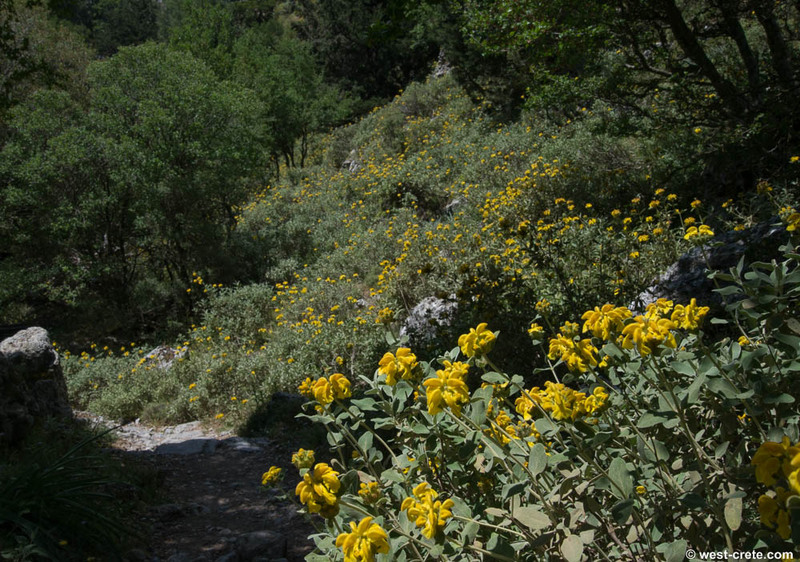 Spring is a really lovely time to walk through Imbros because there are many flowers but bear in mind that April is also the busiest time of the year for Imbros as many tour operators who cannot offer a tour to the gorge of Samaria (which is generally still closed to the public in April) will come to Imbros. So you could be sharing your walk with a number of coach loads of tourists. If you want to avoid this start late (around noon). Walking in summer is OK. 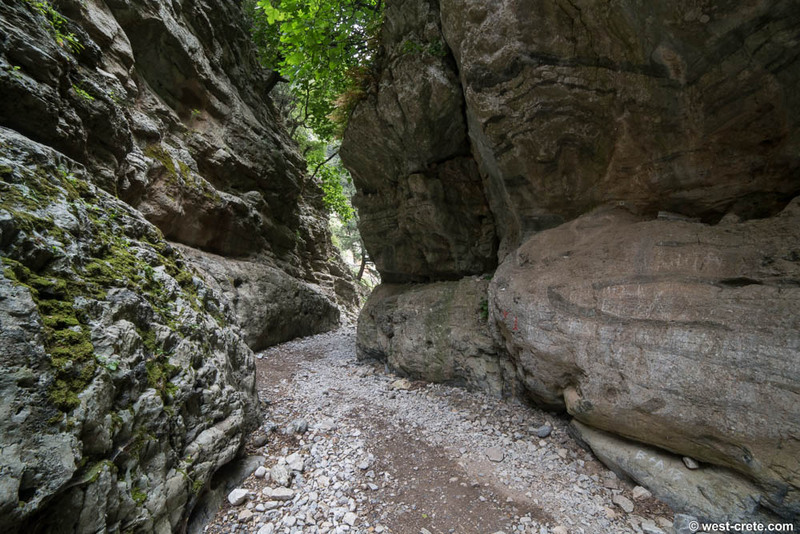 The gorge is shaded and as you are going down on a gentle path you are not going to suffer too much from the heat. 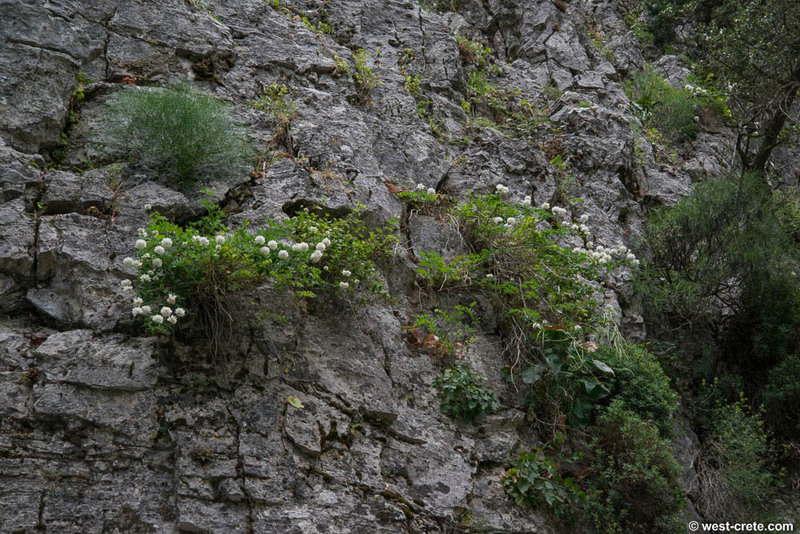 But once you get past June you will miss all the beautiful flowers that grow in the cliffs. 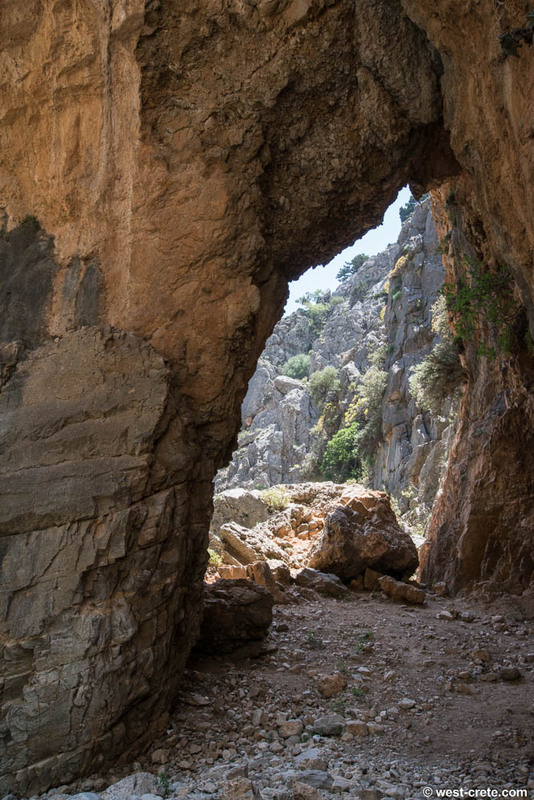 The gorge of Imbros was the main route through which Allied Forces evacuated Crete in late May 1941 after losing the Battle of Crete. 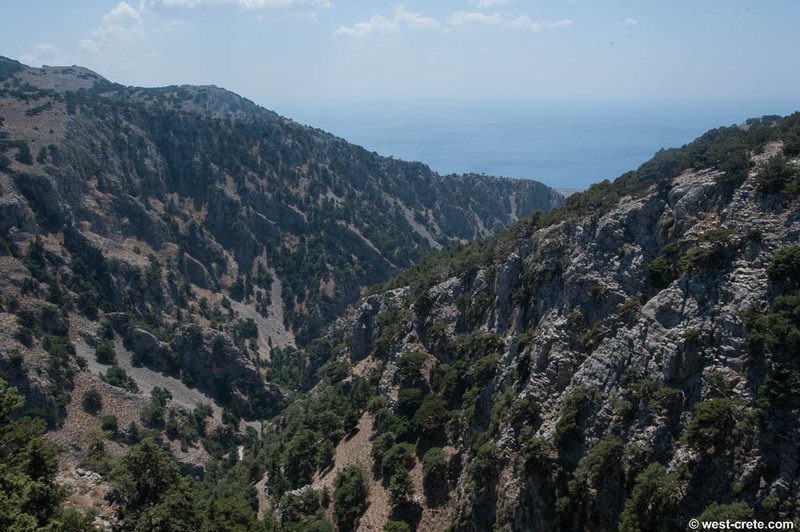 Close to 20.000 troops (mainly New Zealanders, Australians and Brits) headed from the North of the island through the gorge of Imbros to Komitades and Hora Sfakion where they were due to be picked up by ships and taken to Egypt. About 13.000 made it onto ships. The rest were made prisoners by the Germans or escaped to the hills. 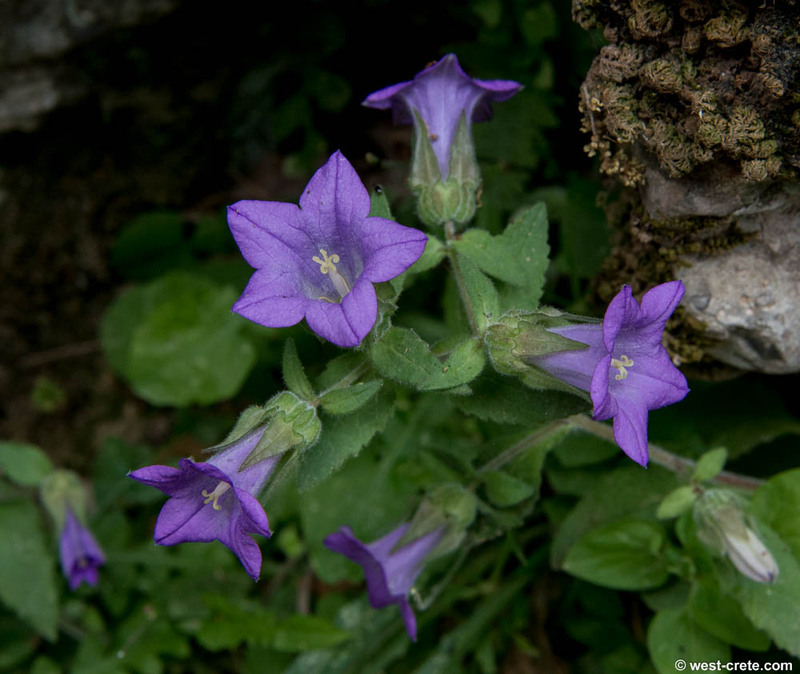 There is a monument in Hora Sfakion commemorating these events. 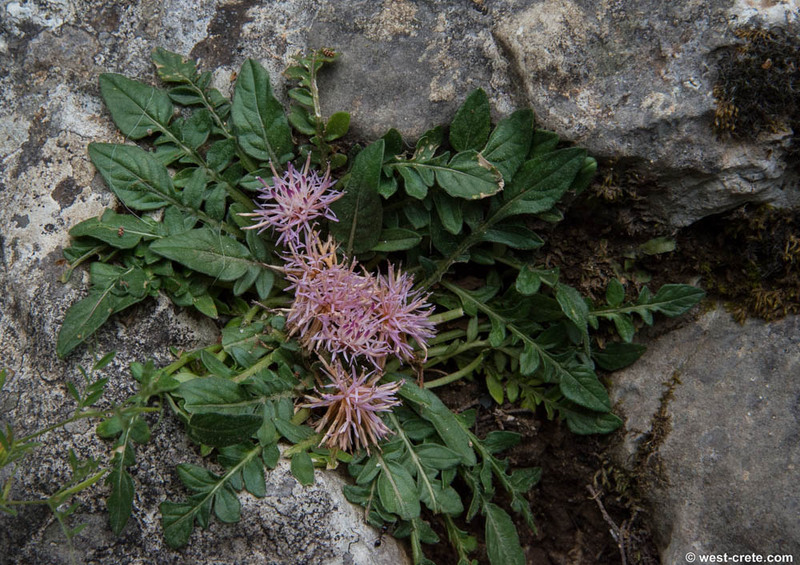 These photos were taken during various seasons. 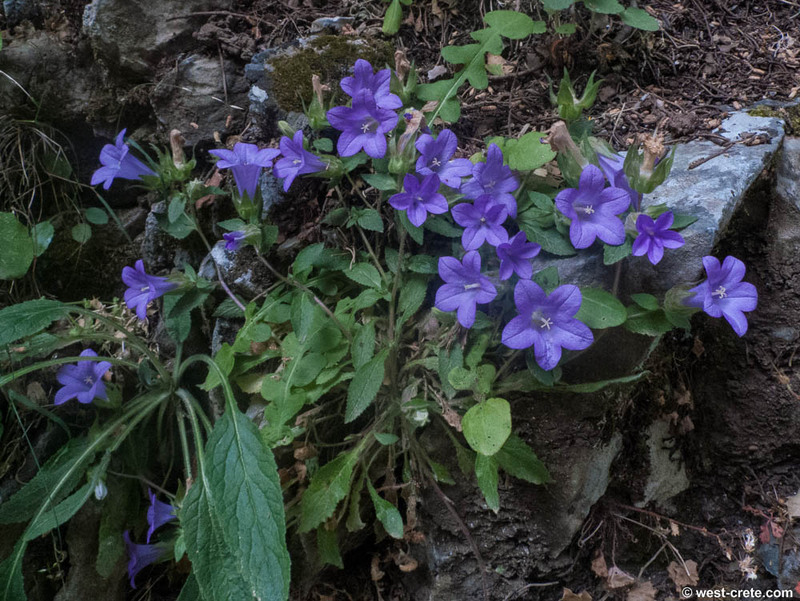 Bear in mind that if you come in summer or autumn you will not see that many flowers. But the walk is still a nice one.